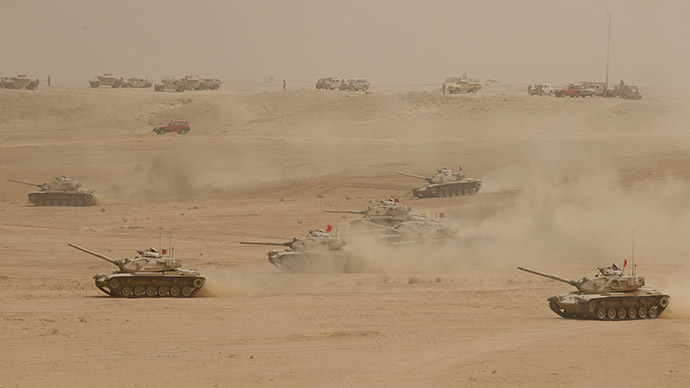 Saudi Arabia has moved its “strike force” to its border with Yemen, according to local media. Although a five-day truce is looming, the Saudi-led coalition and Houthi rebels are continuing to trade heavy fire. The “reinforcement” move followed the intense artillery and rocket battles across the border earlier Monday. The Saudis have reportedly fired more than 150 rockets targeting Yemen’s Saada and Hajjah provinces. The coalition’s planes were reported to have struck Houthi positions in the central city of Taiz as well as in Marib, the oil-producing province of east of the capital, Sanaa. The attacks prompted retaliatory fire from the Houthis, who claimed they had fired Katyusha rockets and mortars on the Saudi cities of Jizan and Najran, AFP reported. The recent exchange of fire comes just a day before the five-day humanitarian truce agreed by both the Saudi-led coalition and Houthi rebels. The ceasefire was scheduled to start Tuesday, but it could be jeopardized by continuing fighting between the two sides. In a statement Sunday, Houthi forces said they welcomed the truce “that has characteristics that serve the welfare” of the nation, but said they would respond to any violations of the ceasefire. The short humanitarian truce would halt airstrikes that Saudi Arabia and its allies have been carrying out for over six weeks. But five days might not be enough to “cover the whole of Yemen,” Iyad Nasr, the regional spokesperson for the United Nations, told RT. The devastation caused by the bombardment aroused criticism from UN officials who believe the bombing to be a breach of international law. There are severe shortages of food and other resources, RT learned from the locals in Sanaa. “We used to run our heating system on diesel, but due to the fuel shortage and the rising price of firewood, we started using discarded motor oil as fuel for the heating system… for the moment, that is the best solution for us to keep our family going and get through this crisis,” said Mohamed Ghazi, who owns a traditional public bath. Meanwhile, over 1,250 have died since the start of the operation on March 26 and more than 5,000 have been wounded, according to the World Health Organization. Local estimates of casualties are much higher.